We are a small boutique travel company based in the beautiful Chianti region in Tuscany. We believe in slow, sustainable travel and love creating meaningful and immersive travel experiences aimed at discovering the authentic cultural and culinary heritage of our Tuscan region. Our travel experiences can last from one day to the whole week and have different themes according to guests interests and needs: from organic wine tastings to cheese making lessons, from “slow food” cooking courses to local handicraft, from sustainable cashmere to olive oil tastings, not missing visits to local villages and art centers, hikes in the nature and lots of time around the table, sharing stories and experiences. "For the visitor who wants to experience Tuscany in a real and authentic way, we can't recommend KM Zero Tours enough. We could not have seen it the way we did without them. Their introduction was everything, and their philosophy of “slow travel” makes every place you visit a place you want to stay longer and get to know at a deeper level." Lori Sorrentino, Travlinmad. What "KM Zero Tours" means? "‘Km Zero‘ (litterally ‘no distance’) means the conscious choice to buy quality products and to consume them as close as possible to the area of their production, ensuring this way freshness, seasonality and biodiversity." Our name refers to a "zero kilometers" relationship between the producer and you, the visitor. 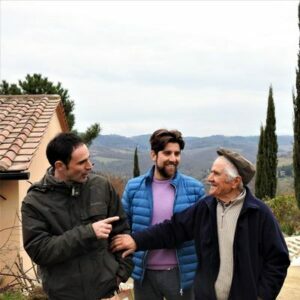 We would like to redefine what it means to see Italy by introducing visitors to the local community and the producers who make it all come alive. And when you buy local and experience local, the reward is a more enriching kind of travel that benefits everyone. "There are no theatrical shows tricking tourists into the fairy tale of Tuscan love affairs, only sustainable, uncompromised and genuine stories about life in Tuscany through the eyes of people keeping up with the ancient traditions that made this region so unique. An experience that comes from the heart. When we travel, it is the people who make the difference." Mar Pages, Once in a Lifetime Journey.